Max got to go sledding for the first time at a friends house. He liked it okay till he tipped the sled over and did a face plant right into the snow. Then I couldn't get him to get back into the sled. 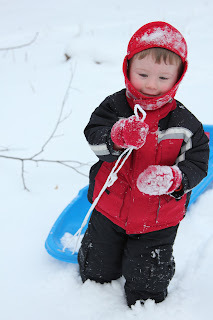 He did enjoy pulling the sled around behind him though. Its Friday so that means only 9 weeks to go till my c-section. I am so ready to not be pregnant anymore. I am really interested to see how Max will handle being a big brother. They say to keep the older sibling involved in the babies care and Max is very helpful by nature so hopefully things will go okay. We got Max a baby brother doll for Christmas and for some reason when we dance to the radio he gets his doll and hands it too me to dance with. He also likes to strip the doll naked which is something he wont be allowed to do with Sam. The University of Texas Longhorns have just revealed their Nike KD 9 Texas Longhorns PE for the upcoming season.For Kevin Durant’s alma mater, Nike LeBron zoom soldier 9 Basketball has designed a special edition Nike KD 9 for the mens’ basketball team.This LeBron soldier 9 Nike KD 9 Texas PE features a clean White Flyknit constructed upper that includes Golden State Warriors Jerseys Orange Burnt accents covering the inner lining, Nike Swoosh branding and KD logo on KD 6 the heel. A speckled midsole and icy outsole completes the look.Take a full look Curry 2.5 at the Nike KD 9 Texas PE below and let us know what you Curry 3 USA guys think in the comments section. The Nike Kyrie 2 Bright Crimson Speckle is James Harden Shoes a brand new Nike Kyrie 2 that’s part of an upcoming “Speckle” Pack.Dressed in Cavalier Steam Shop a Black, Metallic Silver and Bright Crimson color scheme. The Nike Kyrie 2 features stephen curry shoes a Black fused upper with Bright Crimson speckles on the midfoot strap and midsole. Kobe 7 Metallic Silver and an icy outsole completes the look.Look for the Nike Kyrie 2 Curry 3 Dub Nation Heritage “Bright Crimson Speckle” to release on September 24th, 2016 at select Nike Basketball retail Kobe AD stores. The retail price tag is set at $120 USD.